Astronomers used the National Science Foundation’s Karl G. Jansky Very Large Array (VLA) to make the first direct image of a dusty, doughnut-shaped feature surrounding the supermassive black hole at the core of one of the most powerful radio galaxies in the Universe — a feature first postulated by theorists nearly four decades ago as an essential part of such objects. The scientists studied Cygnus A, a galaxy some 760 million light-years from Earth. The galaxy harbors a black hole at its core that is 2.5 billion times more massive than the Sun. As the black hole’s powerful gravitational pull draws in surrounding material, it also propels superfast jets of material traveling outward at nearly the speed of light, producing spectacular “lobes” of bright radio emission. Black hole-powered “central engines” producing bright emission at various wavelengths, and jets extending far beyond the galaxy are common to many galaxies, but show different properties when observed. Those differences led to a variety of names, such as quasars, blazars, or Seyfert galaxies. To explain the differences, theorists constructed a “unified model” with a common set of features that would show different properties depending on the angle from which they are viewed. The unified model includes the central black hole, a rotating disk of infalling material surrounding the black hole, and the jets speeding outward from the poles of the disk. In addition, to explain why the same type of object looks different when viewed from different angles, a thick, dusty, doughnut-shaped “torus” is included, surrounding the inner parts. The torus obscures some features when viewed from the side, leading to apparent differences to the observer, even for intrinsically similar objects. Astronomers generically call this common set of features an active galactic nucleus (AGN). “The torus is an essential part of the AGN phenomenon, and evidence exists for such structures in nearby AGN of lower luminosity, but we’ve never before directly seen one in such a brightly-emitting radio galaxy,” said Chris Carilli, of the National Radio Astronomy Observatory (NRAO). “The torus helps explain why objects known by different names actually are the same thing, just observed from a different perspective,” he added. In the 1950s, astronomers discovered objects that strongly emitted radio waves, but appeared point-like, similar to distant stars, when later observed with visible-light telescopes. In 1963, Maarten Schmidt of Caltech discovered that one of these objects was extremely distant, and more such discoveries quickly followed. To explain how these objects, dubbed quasars, could be so bright, theorists suggested that they must be tapping the tremendous gravitational energy of supermassive black holes. The combination of black hole, the rotating disk, called an accretion disk, and the jets was termed the “central engine” responsible for the objects’ prolific outpourings of energy. The same type of central engine also appeared to explain the output of other types of objects, including radio galaxies, blazars, and Seyfert Galaxies. However, each showed a different set of properties. Theorists worked to develop a “unification scheme” to explain how the same thing could appear differently. In 1977, obscuration by dust was suggested as one element of that scheme. In a 1982 paper, Robert Antonucci, of the University of California, Santa Barbara, presented a drawing of an opaque torus — a doughnut-shaped object — surrounding the central engine. From that point on, an obscuring torus has been a common feature of astronomers’ unified view of all types of active galactic nuclei. “Cygnus A is the closest example of a powerful radio-emitting galaxy — 10 times closer than any other with comparably powerful radio emission. That proximity allowed us to find the torus in a high-resolution VLA image of the galaxy’s core,” said Rick Perley, also of NRAO. “Doing more work of this type on weaker and more distant objects will almost certainly need the order-of-magnitude improvement in sensitivity and resolution that the proposed Next Generation Very Large Array (ngVLA) would bring,” he added. The VLA observations directly revealed the gas in Cygnus A’s torus, which has a radius of nearly 900 light-years. 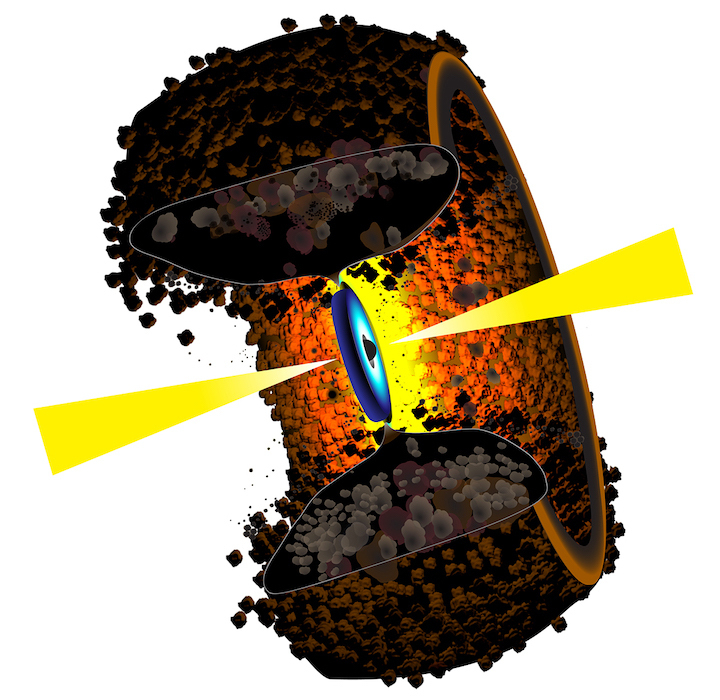 Longstanding models for the torus suggest that the dust is in clouds embedded in the somewhat-clumpy gas. “It’s really great to finally see direct evidence of something that we’ve long presumed should be there,” Carilli said. “To more accurately determine the shape and composition of this torus, we need to do further observing. For example, the Atacama Large Millimeter/submillimeter Array (ALMA) can observe at the wavelengths that will directly reveal the dust,” he added. Carilli and Perley, with their colleagues Vivek Dhawan, also of NRAO, and Daniel Perley of Liverpool John Moores University in the UK, discovered the torus when following up their surprising discovery in 2016 of a new, bright object near the center of Cygnus A. That new object, they said, is most likely a second supermassive black hole that only recently encountered new material it could devour, causing it to produce bright emission the same way the central black hole does. The existence of the second black hole, they said, suggests that Cygnus A merged with another galaxy in the astronomically recent past. Cygnus A, so named because it is the most powerful radio-emitting object in the constellation Cygnus, was discovered in 1946 by English physicist and radio astronomer J.S. Hey. It was matched to a visible-light, giant galaxy by Walter Baade and Rudolf Minkowski in 1951. It became an early target for the VLA soon after its completion in the early 1980s. Detailed VLA images of Cygnus A published in 1984 produced major advances in astronomers’ understanding of such galaxies. The scientists are reporting their findings in the Astrophysical Journal Letters. 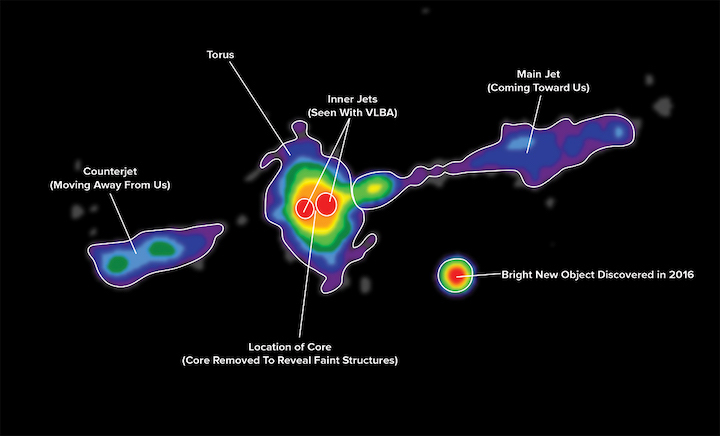 VLA image of the central region of the powerful radio galaxy Cygnus A, showing the doughnut-shaped torus surrounding the black hole and accretion disk.